A group hoping to transform a city flyover said members were “humbled” after raising the funds for a feasibility study of the project. Friends of the Flyover raised the £40,861 needed to carry out a feasibility study on turning the Churchill flyover into a “promenade in the sky”. The group is made up of Kate Stewart, founder of city retailer made-here, Steve Threlfall, from Different, and Mark Bennett, associate architect at Michael Cunningham Architects. It was set up after the city council’s 2012 investment and growth blueprint for Liverpool proposed demolishing the Churchill flyover, which runs from Islington, past Central Library and the World Museum though to Dale Street. Mr Threlfall said: “Wow! Little did we know when we first aired the idea for the flyover how much our city would get behind us and from all quarters. “I can speak for myself, Mark and Kate to say we are humbled by the energy and support that our campaign has attracted. “So many individuals from the city and beyond have made pledges, with their desire to see this become reality. “This energy has also come from key stakeholders in the public and private sector. The project proposes turning the roads into cyclist and pedestrian-friendly routes with planting, kiosks, cafes, lighting and power infrastructure in a scheme modelled on New York’s High Line. The money needed for the feasibility study was raised through a crowd funding website. Mr Threlfall added: “The project has high aspirations from humble beginnings, three citizens with a desire to work with the city, inviting people and organizations to have a say in the shaping of our public space. “The energy we have seen in this campaign, face-to-face meetings, social media and encounters on the street tell us how amazing this project can and will be. Ms Stewart said about 200 donations had been made in the last 24 hours before the deadline for reaching their funding goal. The ambitious plans would also include a programme of cultural events and could include a “theatre in the round” behind the World Museum. If it goes ahead the work would cost between £2m and £3m to complete, with the group looking to raise some money from donations from individuals and companies and getting other funding from the public sector. Hundreds of people turned out to enjoy a street festival held on a flyover in Liverpool city centre. Churchill Way was closed off to traffic but open to people who were entertained with music and song in the sunshine. The event, held by the Friends of the Flyover, was a chance for them to show off their ambitious plans to transform the structure into a new urban park. The Friends group was set up after the city’s 2012 Strategic Investment Framework (SIF) proposed the removal of the Churchill flyover which runs from Islington, past Central Library and the World Museum though to Dale Street. Organisers were encouraging as many people as possible to sign up to become a friend and help make their project a reality. The Friends are proposing turning the roads into cyclist and pedestrian-friendly routes with kiosks and cafes. This article first appeared on Liverpool Echo website. On their link there is also a video from the day of the event available. What better way is there to spend your Sunday, than with a full on Flyover Fest for free from 12 – 5pm? Enjoy performances and busker sets from Vanessa Murray, Dominic Dunn, We The Undersigned, She Drew The Gun and the wonderful Ukulele Club Liverpool as well as a free busking site. You can also join Trev & Angie of Impropriety providing tours with completely fabricated stories about things that never happened on the Flyover…or did they? Add this to great food, street arts, travelling minstrels and birds of prey, Sunday will be a day to elevate all of your expectations when it comes to a party on a bit of road. “The Friends of the Flyover project is one of the most exciting things to happen to Liverpool in a very long time, make sure you’re there to show your support and experience a great day for all ages.” – Chris Herstad Carney, Threshold Festival. This article first appeared on the Open Culture Merseyside Arts & Culture website. This could be Rotterdam or anywhere, Liverpool or Rome. They say travelling broadens the mind and what started off as pleasure soon turned into something much more than that when Kate, Mark and Steve holidayed in the cobbled streets of Rotterdam. Some argue three’s a crowd but this trio are a perfect mis-mash of all skills rehired Kate Stewart, owner of the boldly independent ‘Made Here’ has always been someone influenced by the arts and at the forefront of making Liverpool great is the retailer. Steve Threlfall is the founder of ‘Different’ and has had design running through his blood since he can remember so it only made sense he was the designer. Mark Bennett makes up the rest of the team as the 20 something year experienced architect who’s ability to envisage is much needed. Inspired by the creative citizens and the activists of the city, they spent their days as tourists and their evenings as strategists as they vowed to take the inspiration from Rotterdam back home to Liverpool. One of those very ideas was to revamp and re-purpose the flyover which the city council had proposed demolishing and, as a consequence, create a cultural asset that we can all be proud of. Most people believe they took a bite out of the big green apple when it comes to the aesthetics being so similarly aligned to the New York high line but rest assured this metamorphosis came naturally. The 2012 SIF (Strategic Investment Framework) document for the city proposes removals that would run up estimated costs between £3-4million without arguably any return. Dank and unattractive routes are understandably threatening to any city, both on the eye and potentially on the body so the proposal is met with some rationale. Rather than plunge millions into destroying it, the quandary led the chaps behind the project to reimagine its potential. In a nutshell, they want to redesign it into an urban park, fit with cafes, planting, allotments, pedestrian routes, small studios for artists and a heck of a lot more. We can only imagine such a hub of creativity, an oasis fit for any tourist or local. Most people believe they took a bite out of the big green apple when it comes to the aesthetics being so similarly aligned to the New York high line but rest assured this metamorphosis came naturally. The crowd funding campaign to access feasibility of their dream officially started on January 6th 2014 and quickly captured the interests of a lot of people. In total they were asking for £40k but managed to raise just over £43k as of course the good people of Liverpool and beyond dug into their back pockets and gave what they could. A modern day and touching example of the effect of what a collective conscience can achieve. The day they reached their target they were filming a ‘thank you’ video underneath the Flyover and had just finished when a guy cycling past shouted down; “Hey guys, congratulations, well done!”. It is rare that complete strangers can enter our lives as mysteriously as they leave whilst having profound and everlasting moments with them. It was at that moment they realised they were custodians of his dream and everybody else’s, as well as their own. The money raised will be used to assess the structure by Curtins Consulting Engineers, a local firm with a national profile that will be a integral part of the feasibility study. 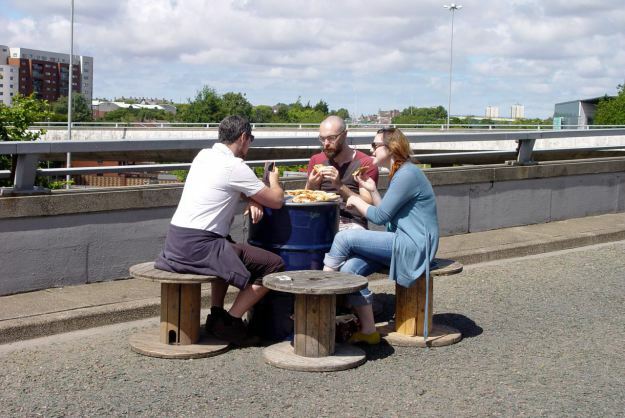 The Friends of the Flyover philosophy of involving the local community as much as possible has also been a notable factor for their success as they are setting up engagement sessions with local residents and businesses. The priority is to be realistic, this is a huge project and before it becomes a part of city life, much needed physical improvements are at the top of that very long list. They did a great project for LightNight recently which was supported by Zumtobel lighting and involved 4 teams of people experimenting with architectural light fittings to see how they could change the feel of the spaces on the walkways and the landing stages around them. One of the great moments was when the public were invited onto the space at 10pm and it suddenly had a new life – the kind of life we envisage for it in the future, with a little more hustle and bustle than is usually there. The success of the evening has resulted in planning a much larger day time event for the summer which will invite the public to come and see the designs they have so far and interact with them giving a chance for people to offer their own ideas and aspirations. The whole project is extremely exciting and has been noticed up by the likes of The Independent and reaching the proposed total to make feasibility checks was the great big first domino being pushed. Be warned, in no way have they reached their apex, this is just the start. With a few licks of paint, or albeit a lot of licks of paint, the blank canvas that is the flyover has been visualised to be much more than that by just three passionate and artistic people. It is safe to say their imagination has spread like wild fire, the recycling rather than destruction of the area is innovative and will hopefully be a model practiced a lot throughout the city which will spur many inhabited wastelands into thriving promenades. Friends of the Flyover teach us a very modern lesson based on a well-known saying; if it’s not broke, don’t fix it, re-purpose it. Visit their website here, follow them on twitter here. This publication first appeared on the Independent Liverpool website.